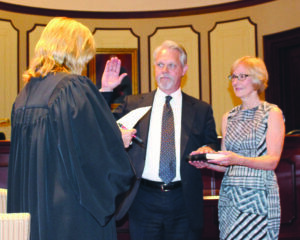 Congratulations to Valter H. Must on his appointment to the Superior Court of New Jersey, Ocean County Vicinage. His wife Ilve held the bible as he was sworn in on July 3, 2017 by the Honorable Marlene Lynch Ford. All of us, at Carluccio, Leone, Dimon, Doyle and Sacks, were honored to have Valter as a partner for the last 5 years. We are proud of his dedication to excellence in the legal profession. We wish him great success in his judicial career. 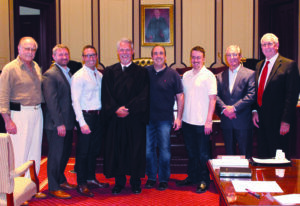 CLDDS Attorneys; Stephan R. Leone, Jonathan Z. Petro, Louis A. Felicetta, Robert L. Gutman, Peter M. Draper, Vincent J. Grasso and Ronald E. Prusek with Valter H. Must at his swearing in.